For a loud-mouthed hatchback with a suite of aggressive cosmetic enhancements and a rear wing the size of Texas, the new, Mk III Ford Focus RS draws astonishingly little attention from passersby. We found that to be true even of the example we were lent recently, which was shod in Ford’s especially-boisterous Nitrous Blue shade – the pigment equivalent of methamphetamine. That’s perfectly fine by us, as one doesn’t get in the Ford Focus RS to be seen; one gets in it to drive. 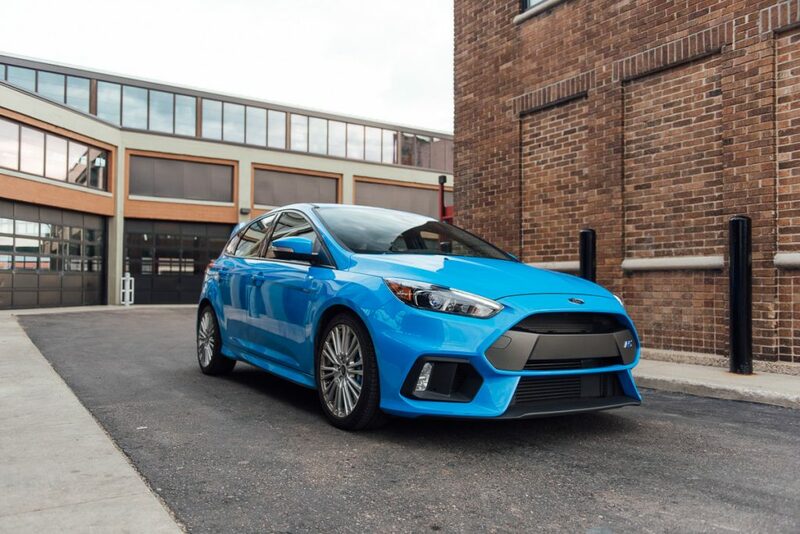 The Focus RS that Ford was kind enough to entrust us with for a week was a 2017 example with an MSRP of $40,255 – $3,480 greater than the model’s base price thanks to the inclusion of the optional RS2 Package ($2,785), and the aforementioned Nitrous Blue quad-coat paint ($695). The RS2 Pack includes such niceties as leather-trimmed Recaro seats, front seat heaters, a heated steering wheel, heated power door mirrors, and voice-activated navigation. For the bulk of our review, we had to make do with public roads, chock full of annoyances like police, fellow motorists, and speed limits, but with a disturbing lack of tire walls or adequate run-off areas. We did our best. At the end of the day, the Ford Focus RS – although more expensive and much more capable than your ordinary Focus – is still “just” a Focus. Beneath its aggressively-styled shell lies an affordable compact hatchback last redesigned in 2010, and some of the shortcomings had by the rest of the Focus range have trickled up unabated into Ford’s range-topping Rallye Sport model. 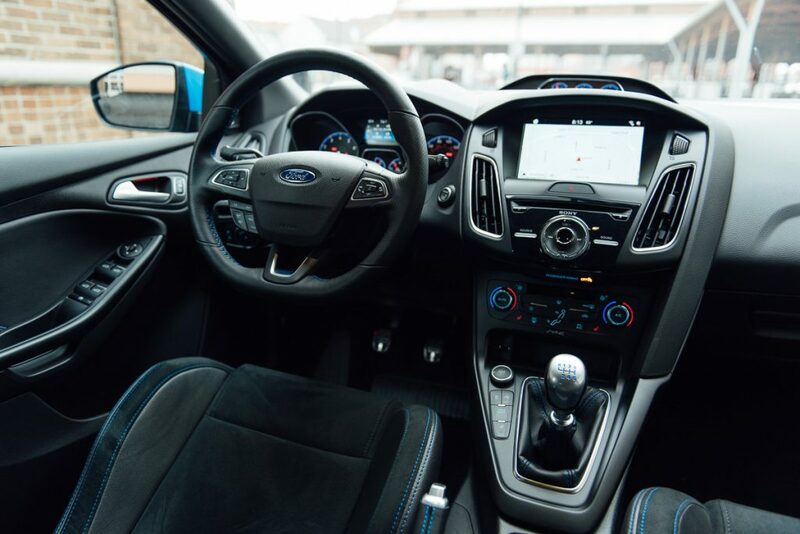 This means there is really no satisfactory place in the cabin to put a modern smartphone, as the bin below the HVAC control panel is both too narrow and too shallow; the center storage bin under the arm rest is, we’re quite sure, Ford’s idea of a practical joke. It also means the dashboard is pretty much the same as what you’d get in the $20k Focus SE, molded from the same hard, unappetizing plastic, and retaining the Focus’ familiar instrument panel and convoluted center stack layout. The one standout extra – an inconveniently-located three-gauge pod perched atop the dash – is a hand-me-down from the lesser Focus ST. It may seem foolish to fixate on such trivial details, but remember: the Ford Focus RS is a $36k car ($40,255 as tested), which is costly enough to put it in the lower end of the luxury pricing range. It’s clear from the moment you climb inside that very little of the extra purchase price has gone into sprucing up the interior; there’s a (rather uncomfortable) set of Recaro sport seats, a flat-bottomed steering wheel apparently borrowed from the ST, and precious little else above or beyond what’s included in the $18k Focus SE. And that’s sort of the point: If so very little of the extra cost hasn’t been spent on niceties, where did the money go? It’s been pumped directly into the Focus RS’ magnificent powertrain. Toss your smartphone wherever you can, depress the clutch and push the start button, and you’ll forget all about such pedestrian minutia as you’re greeted by the deep, rumbling growl of the Focus RS’ 2.3-liter turbo-four. Then, switch it straight into Sport Mode and forget that “Normal” even exists. Although borrowed from the Ford Mustang EcoBoost, the engine is endowed with much more charisma in the Mk III Ford Focus RS, due partly to its higher state of tune (350 horsepower in the Focus vs. 310 in the ‘Stang), and partly to its rather juvenile tendency to crackle and pop upon lifting off in Sport Mode – a result of the car intentionally dumping more fuel than needed. It’s childish, sure, but it scarcely fails to elicit a giggle. The engine – built at Ford’s plant in Valencia, Spain – is so good that it was named to the 2017 Wards 10 Best Engines list. That motor is backed exclusively by a 6-speed manual transmission, and a fascinating (albeit complex) “Twinster” all-wheel-drive system from supplier GKN. There’s a lot of misleading or plain inaccurate information out there about precisely how this AWD system works, but here are the basics: a front power transfer unit sends torque to a unique rear drive module, which uses a pair of electronically-controlled, hydraulically-actuated wet clutches to drive the rear wheels – one clutch for each half-axle. The front wheels are always driven, while the rears are disconnected from the driveline during steady straight-line driving. However, as soon as the car enters a corner or the driver requests a mountain of torque, the rear drive module clutches engage, vectoring torque to each rear wheel based on what the car is doing. The rear wheels are geared to turn slightly faster than the fronts, too, allowing the Ford Focus RS to turn in more sharply and feel almost like a rear-wheel-drive car. And all of this happens quietly and seamlessly in the background, without making the hot hatch feel like a computer on wheels; never does the system’s complexity so much as threaten to get in the way of a connected, engaging, organic-feeling driving experience. The system also makes the Mk III Ford Focus RS appear utterly unflappable, both on the street and the track. 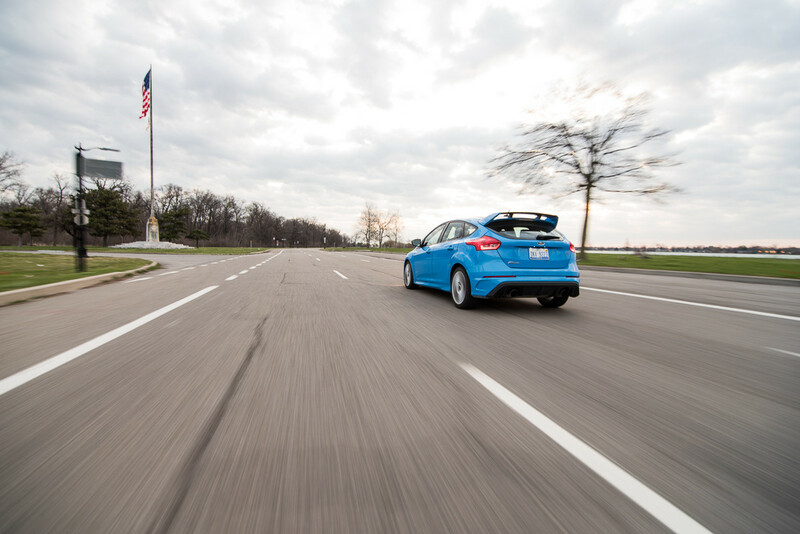 In Sport Mode, the Focus RS never seems short enough grip for the street. Chuck it into a corner, mash the throttle with reckless abandon, and it’ll stay mostly glued – assuming you’ve restrained yourself to something resembling a reasonable velocity for public roads. The hot hatch takes everything you can throw at it in stride, and while the phrase “on rails” has become an overused cliché, it’s apt here. There is, of course, a Drift Mode available to facilitate easy, controllable hoonery, but Ford has been clear that it’s intended solely for the track. Steering effort is nice and high, even in Normal Mode, and quite a lot of information is transmitted to the driver’s paws through the wheel. It’s just two turns from lock to lock in the RS, versus 2.5 turns in the ST. Unfortunately, the turning circle is equally massive between the two (39.4 feet, according to Ford), which can become burdensome in everyday situations. Acceleration in the RS is every bit as addictive and gratifying as carving corners, thanks to its AWD traction and a lack of any discernible turbo lag. At nearly 3,500 pounds, it’s not what you would call “light”, but nor is it all that heavy; that curb weight puts it about on par with the Subaru WRX STI, while its engine produces 45 more horsepower. Sixty miles-per-hour comes up in a brisk 4.6 seconds, according to Car and Driver, which makes it nearly as quick in a straight line as a 2015 Mustang GT. Top speed is governed at a brisk 165 miles per hour. Conclusion: If you’re looking for a performance bargain – an attainable car with enough grunt, grip, and grace to match high-performance machines costing several times more – you’d be hard-pressed to find better. The Ford Focus RS does have one or two issues beyond the lack of interior spruceness and large turning circle. As other publications have noted, the ride is quite abysmal over rough pavement, no matter what drive mode has been selected; the dampers firm up by 40% when Track mode is selected (or when the driver manually activates their firmer setting), but that’d be heading in the wrong direction. What’s more, the seating position is hilariously high; one doesn’t sit in the RS so much as they straddle it like a horse. All this is enough to call into question whether Ford has really managed to make a “proper” hot hatch. A good hot hatch should be “all things to all men,” as Jeremy Clarkson so eloquently put it, but the Focus RS ships with enough unpleasantness that it’s ill-suited to be a daily driver. Sure, it has the seat count and the cargo space necessary so that you could take it on vacation, but by the time you reached your destination, you’d have taken so much abuse you wouldn’t want to do anything. Have a headache and need to run out for aspirin? You’d be more comfortable walking. The truth is, I can’t make up my mind about the 2017 Ford Focus RS. I’ve had plenty of time since driving it to spit out this review, and in that time, all I’ve really managed is to bounce back and forth between “the seats/suspension/half-a-dozen miscellaneous things are all wrong” and “I’d give anything just to drive one again.” My Mazda 3 does a better job with the driving position, clutch feel, and shifter sensation than the RS, and one of those can be had for about half the cost. But then, the Focus RS is just so special. It’s the first Ford Rallye Sport model ever to be sold in the US, it has one of the most clever, well-engineered AWD systems in the world, and it emits those lovely, infectious crackles and pops when you lift off in Sport. There’s no other car sold in the US today quite like it. I just can’t make up my mind, and the 2017 Ford Focus RS has left me a broken and confused man. Take that for what it’s worth. Next story Can You Beat Harry Tincknell Around Spa-Francorchamps In A Ford Focus RS?